Indonesia’s charm is not only about Bali. There are in fact so many other regions within the country that is worth to explore. When it comes to Java, a big island close to Bali, exploring the Indonesia’s ancient temples Yogyakarta will be a nice choice. As you browse about Yogyakarta or Indonesia in general before, you must have a peek to some of the most popular temples in Indonesia like Borobudur. This is because the temple is not highly recommended for tourist to visit. Since Borobudur Temple is on the top list of the must-visit temples in Indonesia, we are going to begin from this temple. So, let’s check this out! Let’s begin from the highlights of this temple. Many tourists come here because they are fascinated with the epic architectural view of the temple while some others come to visit for hunting the most beautiful sunrise spot in Yogyakarta. It offers such a huge temple complex that will take you a day to explore every inch of the temple. It is for sure an amazing historical site that is present in this planet. And it is safe to say that this temple is a site that you have to at least visit once in your life. To get the most of your time in exploring this one of ancient temples Yogyakarta, there are actually some of the unusual ways to come for a visit. The following is what we are talking about. As explained before, most tourists come to Borobudur for a sunrise tour. 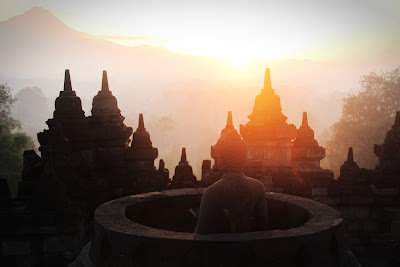 This is because visiting Borobudur area during sunrise allows you to see such magical view. When most of the tour let you to see the Borobudur sunrise from Setumbu Hills, you can make it more memorable by taking a tour inside the site in the sunrise hour. Note: Since the temple is open for public at 6.00, you need to take a tour package that allows you to enter the temple in its magical hour. Instead of rushing back to your car or minivan after the sunrise ends, it will be a good idea to stop for another couple minutes and enjoy the temples on your own. It usually doesn’t take for so long for the crowds to go away after the magical sunrise. So, don’t rush back. You can take your time to walk around the temple and then snap some great videos or photos with the temple as its background. There is no doubt that you will get such a beautiful memory after that. Now, you have another way to explore Indonesia in unusual way. If you are fascinated to take a trip to the ancient temples Yogyakarta like Borobudur Temple here, we recommend you to take a look at www.jogjabromotour.com to get the best deal for your trip to ancient temples in Yogyakarta.